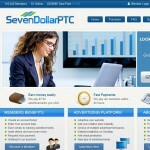 Seven Dollar PTC, found at sevendollarptc.com is a Paid To Click site that claims to pay seven dollars each time you click on an advertisement is the most preposterous of scams I’ve seen in, well, since the last scam article I wrote hours ago. Seriously, though, there is not enough time in my day to read the enormous amount of complaints, bad reviews, business bureau cases and other unhappy posts about Seven Dollar PTC, so it’s a good thing it finally came down to my desk from the huge pile yet to be investigated and reviewed. Wondering where to even start I realized I’m just going to have to build up to the worst offenses, so let’s start with the smaller stuff. There is absolutely no contact information, owners’ names, or company address anywhere on the internet, much less on the Seven Dollar PTC website if you try to get in touch with them. Yes, this is the smallest of offenses. This one is more an annoyance – they get a lot of traffic going to their site, like lemmings over the cliff. That starts to explain the myriad of complaints. This one is more incredulity at their ludicrous boast – there is no PTC site anywhere paying anything remotely close to $7 per click, none whatsoever. That includes Seven Dollar PTC. Most legit PTC sites pay pennies and ever so slightly more per ad click, and it takes a really long time to earn enough to collect. To claim a whopping seven dollars just for clicking on an ad is preposterous. The bait and switch is another offense. After they have you all excited about all that money Seven Dollar PTC drops the other shoe with their payout policy. Seven Dollar PTC account has to reach at least $7,000 before you can cash out. Then they review your withdrawal and if they are not satisfied they can deny the process. Many people have complained that they never get their compensation. They also state that values can change without notice so you never know where you stand with them. If you get as far as being approved, Seven Dollar PTC will send you your compensation through PayPal but you have to wait 25 days. Seven Dollar PTC has all sorts of terms and conditions rigged to have you fail. If they think you violated even one of those conditions they will deny the process. There are so many reasons why using Seven Dollar PTC is not feasible. For one, no one gives a seven dollar amount for a single click. It’s a deceptive ploy you should stay far away from. I do not recommend Seven Dollar PTC. There are far more honest services out there.